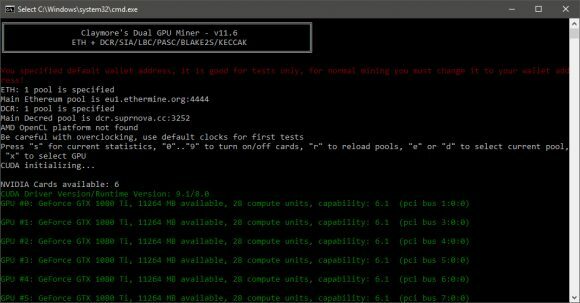 – improved hashrate for weak Nvidia cards by about 1%. – zero devfee for 3GB cards in Windows 10, same as for all 2GB cards. – applied some tricks to increase available memory for 3GB cards in Windows 10 so you can mine ETH a bit longer. – now you can press “y” key to turn on “Compute Mode” in AMD drivers for all cards (Windows only). – Linux version: removed openssl library dependency. – improved “-logfile” option, now you can use it to specify a folder for log files, use slash at the end to do it, for example, “-logfile logs\”. – added “-epoolsfile” and “-dpoolsfile” options. 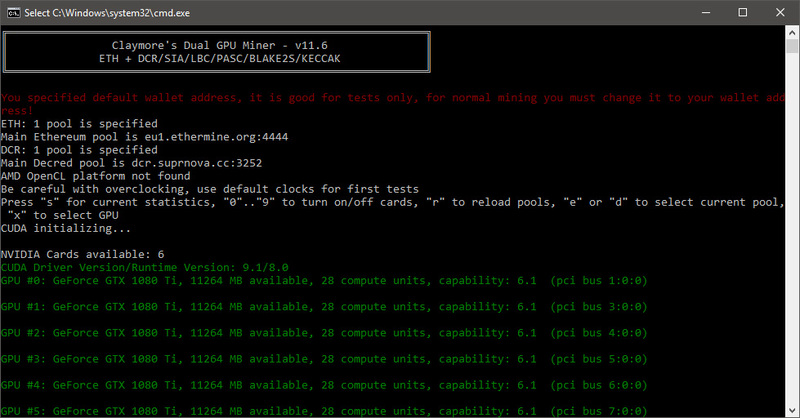 – remote management: now “miner_getstat2” command also returns PCI bus index for every GPU. 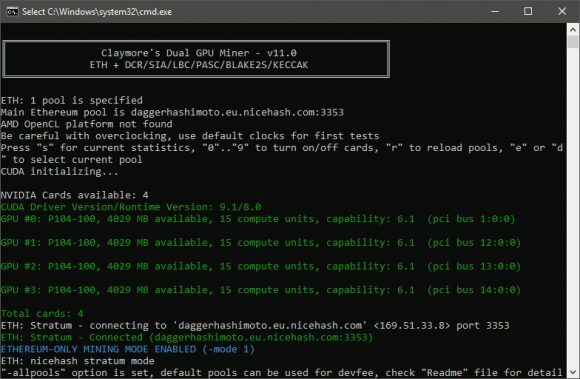 Claymore has released an update to his popular Ethereum dual miner for AMD and Nvidia GPUs with some new interesting and useful features as well as some small improvements. The new version 11 comes with two new algorithms that can be used in dual mining mode along with Ethereum or any other Ethash-based coin, these are Blake2s and Keccak. Another importan change is the reduced developer fee for dual mode that is now at 1.5% and the removal of the dev fee completely for video cards with just 2GB of video memory (you cannot mine ETH/ETC with these anymore, but the miner will work with other forks). The “-asm 2” option value now supports Tahiti, Tonga, Ellesmere, Baffin AMD GPUs and in some cases it can be a bit faster in ETH-only mode, so you can give it a try if you have a mining rig with any of these. 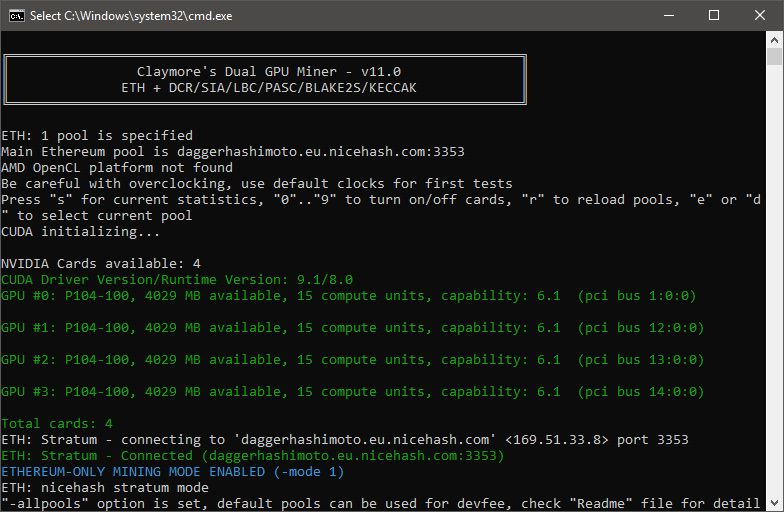 Claymore’s Dual Miner now offers support for both AMD and Nvidia GPUs for both Linux and Windows (binary only releases), so you can dual-mine Ethereum and SIA or DCR at the same time or only use the miner for Ethereum mining. 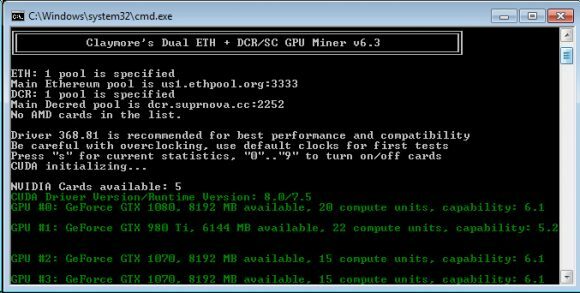 Using Windows 7 is recommended for Nvidia video cards all the way up to Maxwell and Windows 10 updated and with the latest video drivers or Linux is recommended to be used for Ethereum mining, regardless if you use the dual miner or other Ethereum mining software. The latest version 6.3 is no longer beta and it also adds support for NVIDIA 10xx cards in Linux, there are only 64-bit binary builds available though. Claymore is also making available a modification for a driver for Nvidia Pascal GPUs (GTX 10xx series) for Windows 7 that should work better than the standard ones, so if you are using GTX 1080, GTX 1070 or GTX 1060 on Windows 7 you can check the driver out as well. The Dual miner has support for both Getwork and Stratum for Decred (DCR) as well as Getwork and Stratum for SiaCoin (SC), however not all Stratum implementations are currently supported as there are multiple ones used by different pools!